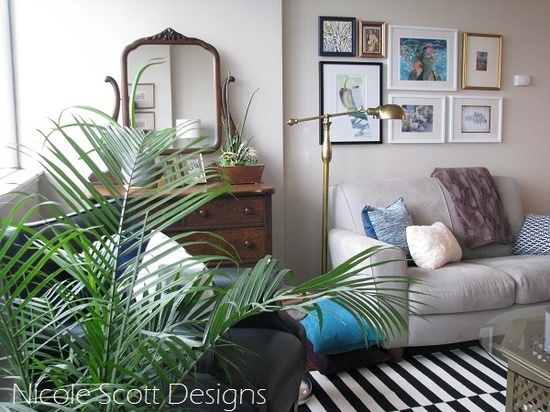 Ikea's Stockholm Rand Rug is one of my favorites for giving your room a bold burst of flair. It's an effortless addition to add to your mix, and easy on the budget for a large rug! My friend says it hurts her eyes, and she couldn't do it, what do you think? I had it once in an all white room - ( it does hurt the eyes a teeny bit lol ) but it looks great with everything really !!! 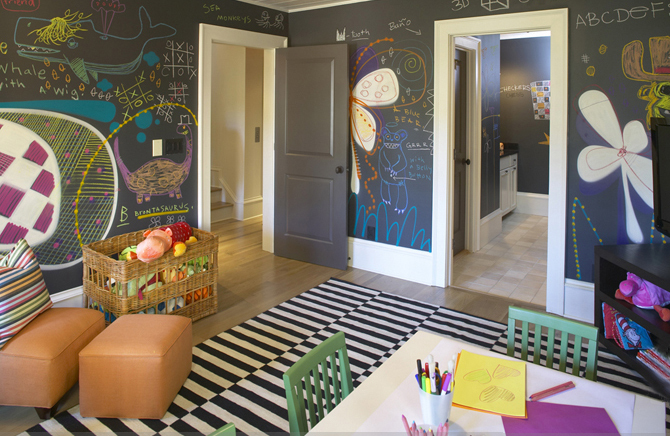 Amazing how it takes on the look of so many different types of rooms. Great selection of photos. 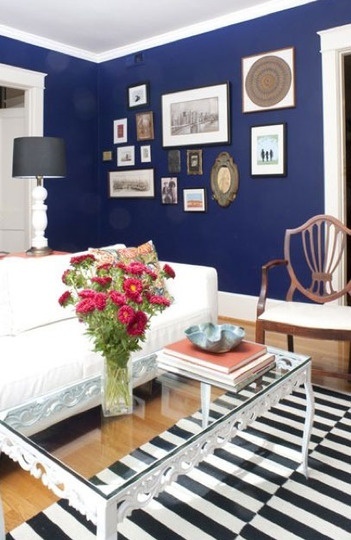 Oh, I really love it paired with the navy sofa....would have never guessed that combination would work; but it does! I actually like it mixed with a lot of white and green. I'm loving green, with black and white these days! I never get tired of this rug. The last time I went to my Ikea, they were sold out...I need to go back. I love the rugs look a lot and it looks stunning in the photos. But I have to admit that I can't stand flatweave rugs. I don't like how thin they are and the way they lie on my flooring. That's the reason why I have never bought one. 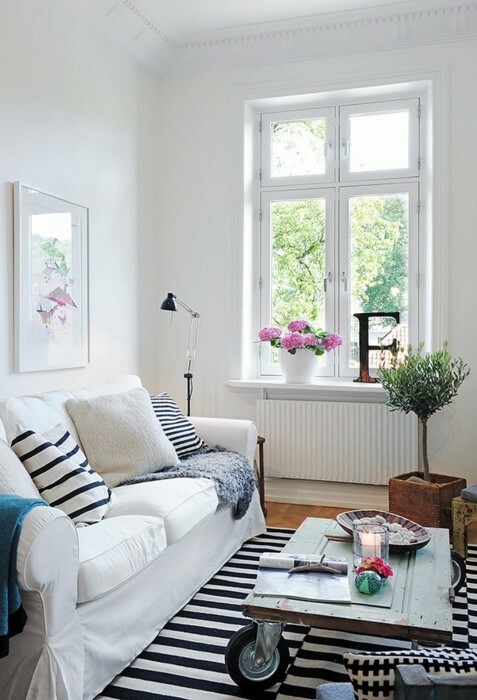 I bought the Ikea black and white LAPPLJUNG RUTA rug instead for our basement and love it. 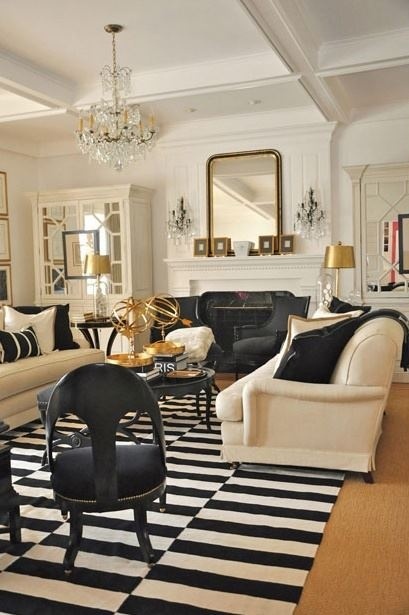 That rug is just beautiful in all those rooms and at a reasonable price. I love this rug too but like Julia wish it was a little heavier and not so thin. I had it in my family room for 2 days and had to take it back because it was all bunched up under the sofa and coffee table.. Maybe in a room that does not get a lot of use..
i love this rug and hope they keep it in production for a while... i can see myself using it in emmy's room a couple years down the road. Ikea really needs to hire you as their Chief Marketing Officer! I love how you highlight these finds that are stylish and affordable. I love the graphic-ness of this rug but it would be covered in dog fur in my house so sadly, it's out. Love love love the look of it to punch up a room's decor. I like it! Interesting to see how it works well in such a variety of spaces. Definitely one of my favorites too. I would love to use it in my next home! It looks gorgeous in every setting, however, I tend to think it would hurt my eyes too. I don't know the "why" but I have Meniere's Disease, a form of vertigo, and many patterns affect me adversely. If not, I'd use this rug in a heartbeat! I have always wanted to buy this rug! Wanted to use it for our son's apt but did not get to. Was thinking of finally getting it and trying to find a place for it in the new house, not sure where though. You found new inspiration pics that I have not seen, love each one. You are best Ikea shopper ever! I love your Ikea posts! I agree with you Pam, this rug can go with any type of home style - from the opulent to low-key,very versatile and eye-catching for sure.I say a big YEY to this one! 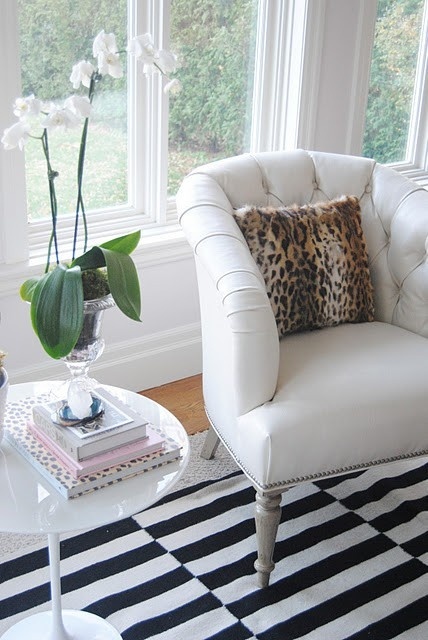 I have seen that rug in so many interiors...goes so well with many designs...I really like it! 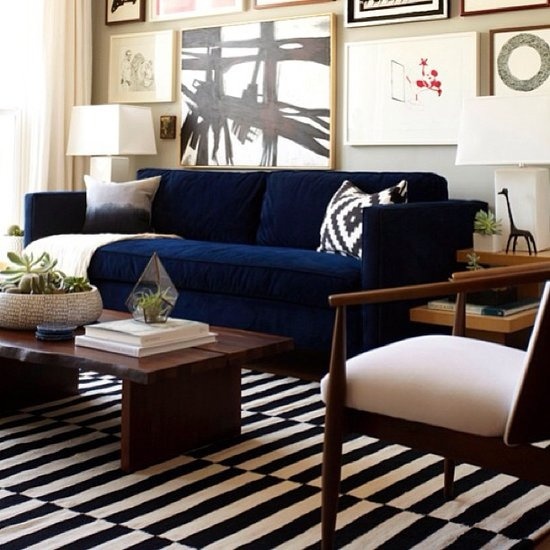 Love this rug and I think its a do! 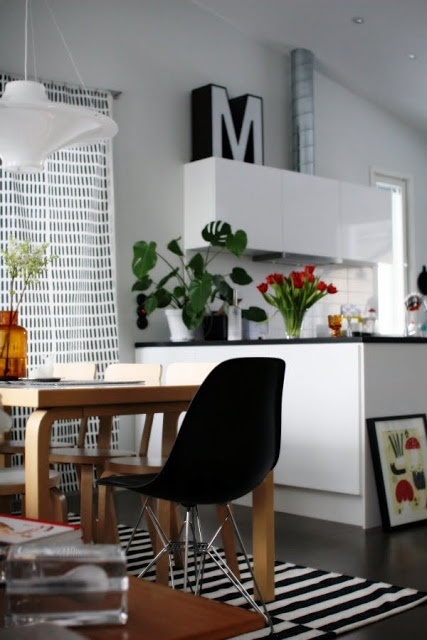 Also have bought those IKEA acrylic chairs a few times bc I love them as well. IKEA is the mac daddy or reasonably priced home goods! Hands down one of my favorite Ikea pieces. It seems to jump of the shelf down here...it's never in stock! I never knew where that rug was from but always admired it. Thank you! Hi. It hurts my eyes for the first 2 weeks I own it (haha) but now I'm used to it. It is a great rug. I have the big one. I use it in the living area.